That’s what I’d like to help us think about in this blog. The concept of this name comes from John 15:5, “abide in Christ.” In this context, to marinate means to think about, to meditate on, to dwell on. In this blog, I want to help us think about and meditate on the amazing gospel of grace and leadership in life and the church. For some reason, God has placed me in positions of leadership at every level of my life. I was a team captain on each of my middle school, high school, college, and NFL football teams. I never wanted to be a lead pastor, yet God has seen fit to gift me, and sovereignly place me, as founding and lead pastor of Transformation Church—a multi-ethic, multi-generational, mission-shaped, loving community. In just four short years, we have grown in spiritual maturity and influence, and have experienced exponential numerical growth. 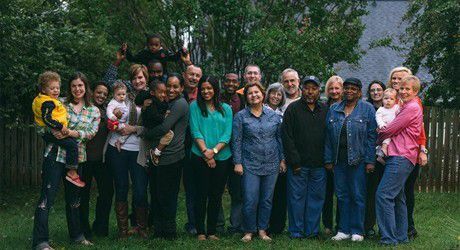 I want God to use Transformation Church to influence the church in America towards becoming more Gospel-centered and multi-ethnic. If you’re looking for expert advice, I’m not your guy. But if you’re looking for a practitioner who is in the struggle with you, who doubts at times, and who desires to learn and grow in every facet of life, I think we can help each other. My family and friends call me “D. Gray,” “Dewey,” or “Pastor Derwin.” I’ve been married to my best friend, Vicki, for twenty-two years. Vicki has loved me into being the man that I am, and the man that I am becoming. I couldn’t imagine life without her.